The title of this guide is an oxymoron if ever there was one. Standing is the opposite of running; the latter involves movement, and the other is all about staying still in one spot. But it is much harder than it seems – especially when you’re on your feet the entire day. People working in retail know this, and so do others employed in hospitals and hotels. Jobs which involves standing and walking put an enormous amount of stress on your feet. Just take a moment to think of it; the entire body weight rests on the feet over a period which could be anywhere between 6 – 14 hours a day. Many ER personnel/doctors/nurses regularly work 12-hour shifts. If this is done wearing regular shoes, the experience can quickly become unpleasant. The sole feels tired and strained; you can’t wait to get home and take your shoes off. Even shorter shifts of 6 – 8 hours are tiresome. Solereview frequently receives footwear questions from readers employed in the medical and retail industry. When choosing a pair of shoe for being on your feet all day, there are a few design attributes to look for. If this sounds somewhat similar to our walking shoe guide, then that’s because both walking and standing have shared design needs. 1) The outsole design should preferably be wide and flat: An outsole with full ground contact is important as it helps spread the pressure in an even manner. Over a prolonged period of standing, protruding outsole lugs can eventually end up becoming a source of discomfort. 2) The midsole should be cushioned: You need a comfortable shoe if you’re going to be standing all day. Also, both the forefoot and heel should have ample cushioning because you will constantly transfer weight between the heel and the ball of the foot. 3) A spacious upper for foot splay: A narrow fitting shoe can be torturous during long hours of standing, so you need a shoe with enough splay room. 4) Good grip for smooth artificial floors: Most jobs which involve standing are located indoors with artificial floors. So it is important for the outsole to have good traction. Do running shoes check all the boxes for standing all day? It depends. In our opinion, most running shoes do OK for standing – only if it is for 6-8 hours. People working in sporting goods stores fall under this category, where the shifts are relatively shorter. In some cases, sporting goods store employees get to choose a product to be a part of their uniform, so it makes sense to get a running shoe. Anything longer than 6-8 hour shifts, and you’d want to adopt a different footwear strategy. We say this for a couple of reasons. 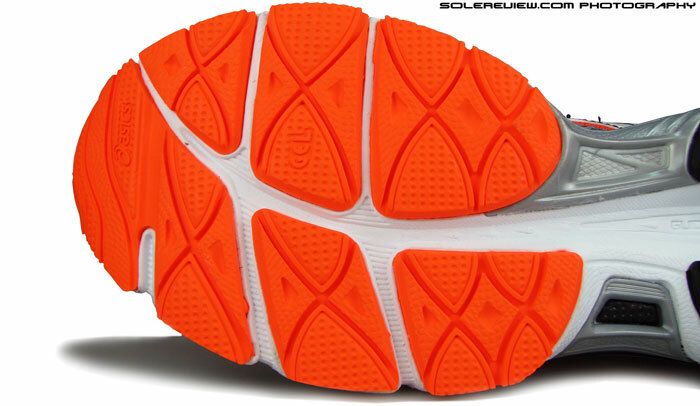 Most running shoe outsoles have rubber lugs and grooved separations which apply pressure from underneath. This isn’t an issue for a few hours but tends to manifest itself over a longer period. The other limitation is the narrow waist of the running shoe. The midsole is slim around the middle, which translates into a conforming upper fit. Running shoes are built this way for a good reason, because the foot needs to be locked down during runs. But the same snugness which benefits running might be detrimental to comfort during 12+ hours shifts. 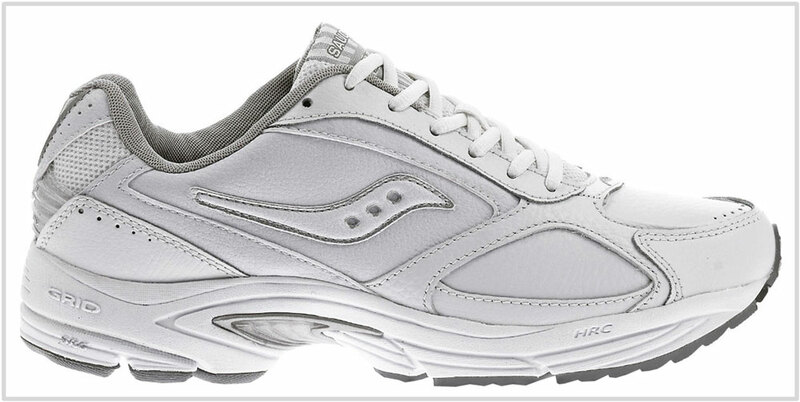 1) Plain colors: If the workplace atmosphere is formal, then conspicuously colorful running shoes could be a problem. Many running shoes nowadays have more hues than a sprinkled donut, making it unsuitable for formal settings. Hence, plainer colors like all-white or all-black might be desirable. The second part of this guide addresses such aesthetic needs. 2) Maintenance friendly design: Some jobs which require standing all day happen to be in the restaurant business, and the shoe is likely to come in contact with spilled liquids and the like. So a mesh upper won’t cut it, but rather fully covered leather uppers which are easier to wipe clean. Most running shoes do not fit this description. 3) Non-marking outsoles: Certain workplaces require footwear to be non-marking. This is the property of certain outsoles which leave no black skid/scuff marks on the floor. If the shoes which are part of your uniform have non-marking outsoles, then it is important that you find an appropriate replacement. Most running shoes do not have non-marking outsoles. As you can see, finding a shoe which is comfortable for all-day standing isn’t as simple as it sounds. Considering the number of variables involved, we’ve compiled two recommendation lists. 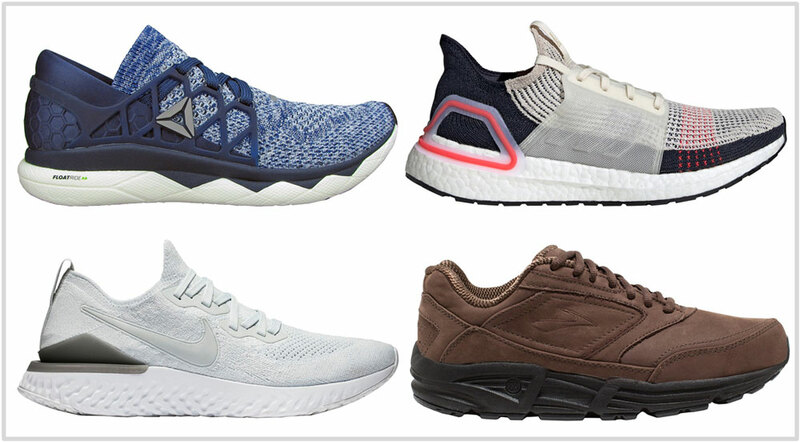 One is a list of running shoes, and another has three walking shoe models. 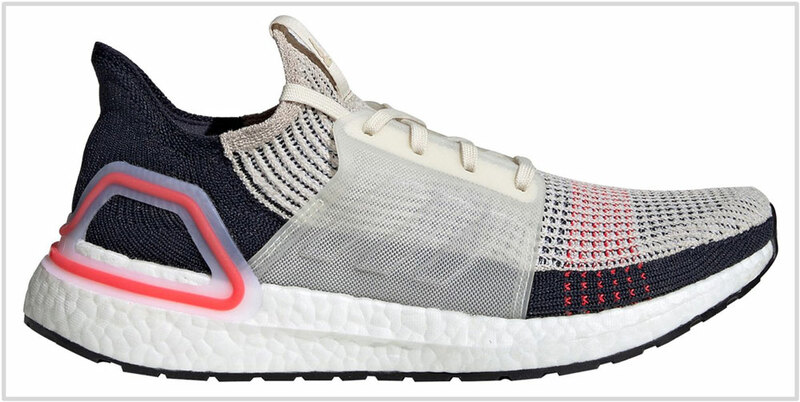 The UltraBoost 19’s high-volume Boost midsole is a comfortable and cushioned platform for standing all day. The new heel clip and midfoot panel provide support to the minimal yet comfortable upper. The interiors get more room over the original UltraBoost – that’s a plus in the context of this guide. The Continental outsole is a marking type with above-average levels of grip and durability. The Epic React has an SEBS (synthetic rubber) based foam instead of EVA. This midsole material provides plenty of all-day cushioning without bottoming out and has an excellent grip on synthetic floors. The outsole is mostly foam in a full-contact set-up which evenly disperses the body weight. The Flyknit upper fits just right but barefoot use is not recommended due to the heel loop. If the color of the outsole rubber on your Epic React is translucent or brown gum, then treat it as a non-marking outsole – because the rest of the outsole is foam. 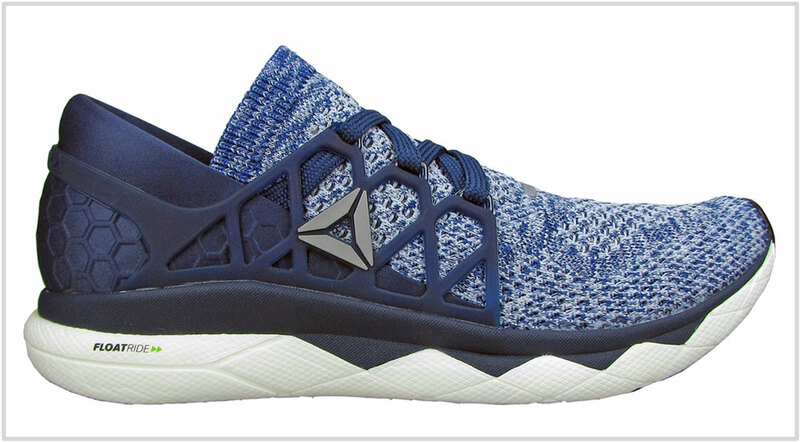 The Ultraknit upper has a relaxed fit for all-day fit comfort so there’s plenty of foot-splay room. The Floatride foam is incredibly lightweight for its volume and delivers a high cushioning-to-weight ratio. The soft and responsive feel makes the Floatride midsole ideal for standing long hours. The grippy outsole uses a marking Carbon rubber. The Max Road Ultra 3 packs bottomless midsole cushioning under a comfortable knit upper – all at a reasonable price. 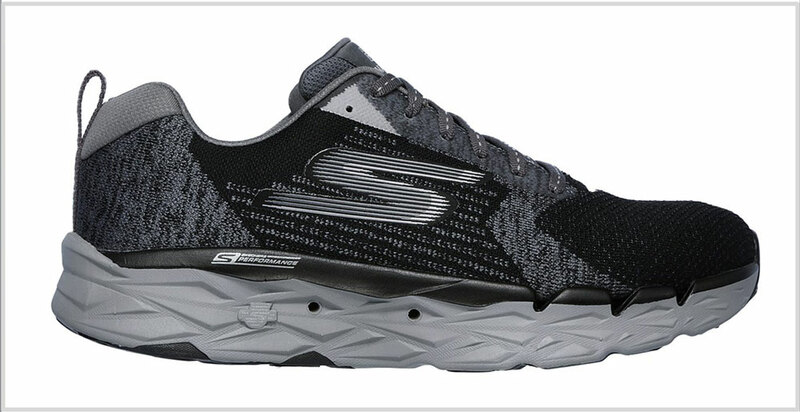 This Skechers shoe is the only one on the list with a perforated (vented) insole placed over a midsole with drainage holes. So if you’re standing all day in hot and humid conditions, then the Ultra 3 should definitely be on your list. What the 1080V9’s Fresh Foam midsole lacks in responsiveness, it makes up in deep cushioning. There’s sufficient foam under the foot to keep it comfortable during prolonged periods of use. The midsole has a topping of a cushy Ortholite insole which creates a layer of softness under the feet. The upper fits just right, and additional widths are available. The Brooks Addiction works great for a lot of jobs which involve being on your feet. There’s a choice of either a brown Nubuck leather upper, or all-white and black milled leather versions with midsoles to match. The ultra-wide outsole is a full contact kind. The Addiction is the only Brooks shoe we know of which still uses ‘Hydroflow’ – an 80’s cushioning technology which uses fluid-filled pouches inside the midsole. Available in four optional widths and three colors. The 928 V3 is a heavy shoe. At over 15 ounces, it is almost twice the weight of many running shoes. In return, you get a full leather upper, a stable yet cushioned ride, and a non-marking rubber outsole in a full-contact layout. Comes in full-white and all-black colors, and one of the rare shoes to be offered in five optional widths. The Omni Walker has the original Saucony Grid system along with a dual-density foam midsole for cushioning. The upper uses 100% old-school materials and construction techniques, and with good results. The garment leather upper and padded lining creates a cozy interior. The Omni Walker sells only in plain colors should your work environment require that. The rubber outsole is a non-marking kind and is safe for streak-prone floors.